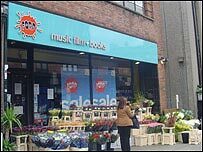 Music and book retailer HMV has struck a deal to buy the Fopp brand and revive six of its stores. HMV has bought the shops - which will trade under the Fopp name - in Glasgow, Edinburgh, London's Covent Garden, Manchester, Nottingham and Cambridge. The price of the deal has not been disclosed. The deal comes on the day HMV sold its Japan business for £70m. 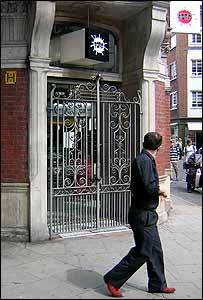 Fopp went into administration at the beginning of July, closing 81 stores and making about 700 people redundant. HMV said all six stores it was buying had traded profitably before they were closed and that the deal would save about 70 jobs. "Ownership of the Fopp brand will enable us to preserve Fopp's unique identity and trading culture," said HMV spokesman Gennaro Castaldo. "These stores will operate independently of the main HMV chain in order to preserve their distinct customer offer. "Fopp is well-regarded by many music and entertainment consumers, enjoying local awareness and appeal and we're pleased that we will be able to preserve the brand and product offer through the stores and online." Fopp fell victim to the slump in CD sales - which is also hitting HMV - with more customers migrating online to access music. Known for cheap CDs, DVDs and books, the Glasgow company had insisted it remained profitable but said it failed to gain support from stakeholders and suppliers. Separately, HMV said that the sale of the Japan business to DSM Investment Catorce, would allow it to focus on countries where it was a market leader. Opening in Tokyo's Shibuya district in 1990, HMV Japan now has 62 stores, with about 40 million visitors a year. HMV chief executive Simon Fox said that proceeds of the sale would be used to pay down debt, and that the deal represented the best value for its shareholders. Last month HMV revealed annual profits had more than halved. Along with other music retailers, it is trying to reduce its dependence on the sale of physical music such as CDs. These efforts include selling digital downloads in store and continuing to expand its online business. HMV is also increasing the range of items it sells to include MP3 players and DAB radios, and will allow mobile phone firm 3 to open concessions in some of its stores. By close of trade shares in HMV had climbed 5.3%. What comes next when record shops close down? Why is troubled EMI still dependent upon old music?